This is so pretty Colleen! Love the background stamp and the sparkle of the gems! wow totally gorgeous.. love the added gems.. Beautiful!! I loveeeeeeeee the colors and the bling!!!! So very pretty! Love the colors, background and lovely sprig! So very pretty, Colleen, and done in beautiful colors. That background paper is awesome! Oh, how pretty! The colors are scrumptious. Love the background stamp and the die cut. All things flourished and swirly are love, love, love! I remember how she looked in the dress and I could see some of her hair. I say go with them to the prom. Locking her in the bedroom would be too cruel..... ;-) The card is lovely! I really like the colors, die cut, and the added rhinestones too! This is so so pretty Colleen!! Colleen this card took my breath away. 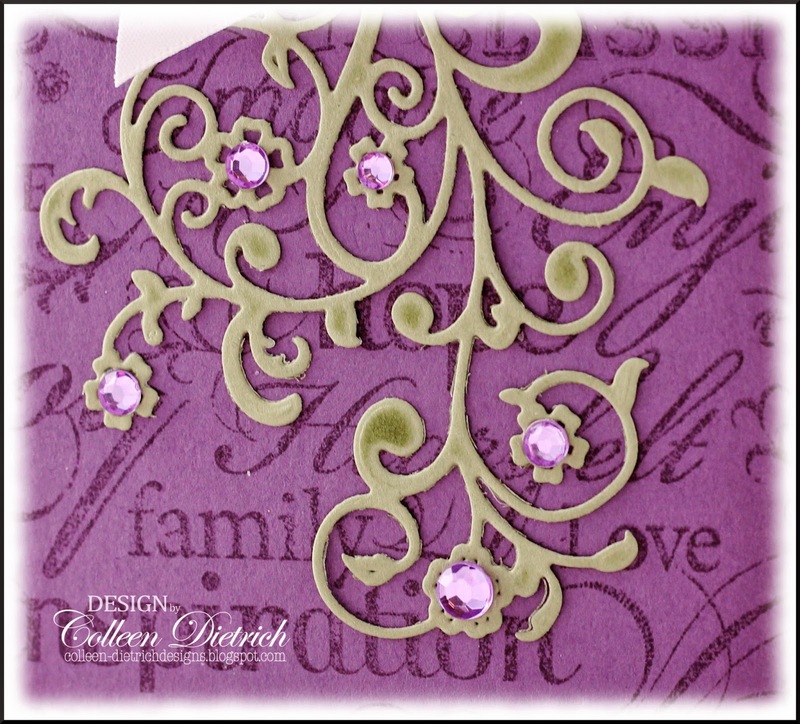 The backgorund stamp is perfect for an elegant card and I love that "mistletoe" you used. Perfect with the amethyst gems. Wow! So pretty, Colleen and the colors work beautifully together. I love the touch of bling from the rhinestones.